This was the 11th day of the Get Back/Let It Be sessions, and the second to take place at The Beatles' Apple Studios in London. 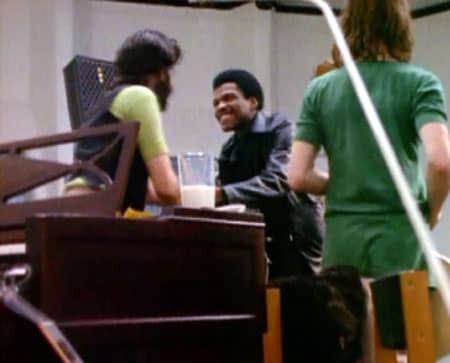 It was also the first to feature Billy Preston, who had been invited to Apple by George Harrison. Preston had first met The Beatles in Hamburg in the early 1960s, and was in London playing with Ray Charles. His presence on piano and keyboards helped flesh out the sound considerably, which was helpful given the 'no overdubs' rule of the sessions. The mood within the sessions was greatly improved, with greater focus on the songs they intended to perform in the live special, and fewer displacement activities such as cover versions and improvisations. Three songs in particular received the bulk of The Beatles' attentions on this day: Don't Let Me Down, I've Got A Feeling and Dig A Pony. Versions of I've Got A Feeling and Dig A Pony from the session were included on 1996's Anthology 3. This version of I've Got A Feeling, plus different ones of Dig A Pony and Don't Let Me Down, were selected for Glyn Johns' first Get Back album, which was rejected for release by The Beatles. Also included were Rocker, a Beatles jam in the style of Chuck Berry, and a cover version of The Drifters' Save The Last Dance For Me. The only other notable attempt at a cover version from this day was A Taste Of Honey, first recorded by The Beatles in early 1963 for the Please Please Me album. On this day, however, the performance broke down almost before it even got going. I just want to tell you that this running documentary on the Get Back/Let It Be sessions, is outstanding. I was a teenager in the US during this time, I remember reading about the recording session in the papers from time to time. And when the first bootlegs came out we were astounded at how bad they sounded. A really great insight you give in this series is that they were still exhausted from the White Album sessions. I had never really considered that. I have done studio recording myself with a band doing all original material of full album length (and please know I am now way comparing my experience to the Fab), I can tell you it is grueling work. It’s fun for the first couple of days but after awhile it becomes a labor of love. Playing the same songs over and over, pressing your creative abilities to their max and putting up with everyone’s ego just wears a person out. When I look at the output of music per day, day after day, and add to that the cameras and as they themselves have said, they were all fed up with each other by this time, the miserable Let It Be sessions are no mystery. The fact that they regrouped for Abbey Road is a testimony to how much they really loved each other. Hey, thanks Robert. I’m glad you like the articles! Yes, they were likely still exhausted from the White Album sessions, although they did finish in October 1968. I suspect it was being based in Twickenham for over a week that made them really fed up – things seem to have picked up once they got to Apple, back with George, and with Billy Preston joining them. Everyone talks about how bad the Let it Be sessions were but I don’t think they were as bad as the white album in terms of tension within in the band. At least they are playing as a band which cannot be said of the white album or Sgt. Pepper, which I mark as the beginnig of the end and Paul’s take over. Look at the rooftop performances. I think they sound great and they are all playing together. Just got the A/B Road box set of the enitre Get Back/Let it Be sessions….it’s incredible! This day is great, starts with Paul on drums!